Snoop G had the most liked content! having a Blacktop SR20det with a T28 BB 3" exhaust FMIC I want to upgrade the injectors is 1000cc a bit much. Cause ID 1000 seem like a good buy. And don't get to pay the same amount to only get 850cc. Question is there a negative running 1000c on my setup ? will it run too rich? u got an engine bay pic of this ?!1?! would help the sale greatly. one of the best 180sx in Melbourne. Whats planned next ..Neil mod wise? one of the sickest things ive seen . out of interest is the engine stripped of pistons and rods and things to save weight. or is it the full weight of a real engine. what's the benefits of having a hybrid 13.4 rocker cover ? that Koyorad looks the business. where did u get it from man and how much ? 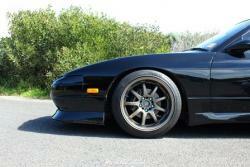 you no longer doing front 180sx struts are you ? not really cause there so many different setups. yeah same i am lost with my setup cause i was thinkin doing the very same in terms of changing the manifold mainly cause it will look so much nicer. But if its gonna effect the response. Well then im now not sure.